DanceMaster is a music player designed for rehearsal. 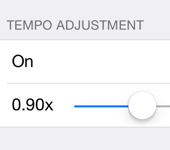 If you supply the original tempo for a piece of music (either via the "BPM" field in iTunes, or by setting it directly in the app), DanceMaster will show you tempo adjustments and cue lead-ins in beats instead of seconds. To help you memorize a choreography, DanceMaster can speak your cue names during playback, so you don't need to look at the screen or your notes while you rehearse. DanceMaster now includes an Apple Watch app that allows you to control the music, jump to defined cues, and even change the tempo without having to go back to your phone. It's perfect for active rehearsals. DanceMaster also works with Control Center and can be controlled with any remote that works with iOS, including the standard iPhone earbud controls and external Bluetooth remotes. DanceMaster is now available in the App Store!